What should Prince Philip do? We don’t really know all the details of what happened in the royal accident in question. Difficult to make a decision based on just the Duke being a nonagenarian. But what puzzles me is the Duke can have 24hr access to a professional chauffeur [ and Royal bodyguard/minder no doubt ] so giving up the actual driving is no real inconvenience to him getting around, and the people who care for him would obviously welcome such a arrangement. So i don’t really understand he wants to drive at such an age when he doesn’t need to. What was he doing ? Just nipping out for the newspapers and milk ? He could have sent the Beefeaters out for that. My guess is that both of them are two parsnips short of a harvest festival box. Another? I very much doubt he has ever taken a driving test. My father, who would have been 89 now, was old enough to have got his first licence pre-testing. 24 hours after the rather nasty accident, he had to be spoken to by the Police for failing to wear his seat belt. Time to summon the chauffeur me thinks. And then face the complaints about tax payers money being used to drive him about. Mind, probably our money which shelled out for his new Landy on Friday too. Maybe another ‘accident’ could be arranged? He may enjoy driving and the bit of independence it offers. It hasn’t been proven yet that he was at fault, has it? I’ve not heard any outcome from the investigation as yet. But he is independent. He can call for a driver whenever he wants and go where ever he wants. Two incidents in 24 hours doesn’t make him guilty but it must raise questions. I also wonder if the Police would investigate as vigourously as they would if it were us mere mortals. Regarding the question why does he drive, that could be asked of any of us: convenience? Freedom to choose where and when we travel? Enjoyment of driving? And in his case, very possibly, freedom to be away from security guards. Freedom to actually do something for himself, where so much is controlled by protocol and the system he is in. I for one can certainly understand why he would want to, and why he might be more reluctant to give up than any one of us, or any elderly relatives we have tried to persuade. As for annual driving tests, really? Maybe every 5 years might be more realistic. From what age? Actually shouldn’t all drivers be required to have a regular re-test, or be required to take and pass an advanced driving test within 5 years of first learning to drive (e.g. Institute of Advanced Motorists)? Meanwhile it seems to me someone else involved in the accident is trying to make mileage out of this (I suspect egged on by the media). Did they seek to ask after the DoE before the media started posting that he was OK - a very old man whose vehicle rolled over in the collision? What should he do? Yes, wear a seat belt because that is the law. Possibly have a medical check to confirm (or otherwise) that he is fit to drive, and under what limitations - but certainly if it was the fault of the other driver, which it might be for all we know, the fact of the accident does not dictate this. And being aware of his forthright nature, I can guess at one of his actions if he sees any media hanging around - and the second word he utters will be “off”. Did IB speak up for freedom just then? I do believe in freedom! (I just don’t believe that to all intents and purposes the UK will be any freeer outside EU than in, while the negatives outside the EU outweigh the negatives of remaining in). But back to this thread: that is of course freedom with responsibility. He has given up his driving license. 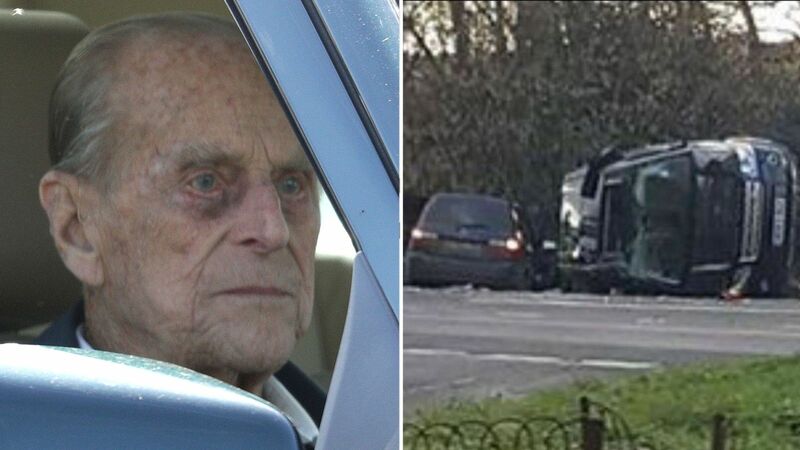 Prince Philip, 97, apologised after the accident which saw his Land Rover Freelander flipped over on the Sandringham estate. The benefit of handing in your licence, win-win - no prosecution, no further action. He can still use the pony and trap, I presume.